Plastic Processing Machinery Market Report 2017 — 2021 is a professional and in-depth study on the current state of the Plastic Processing Machinery industry. The report analysis the global market of Plastic Processing Machinery by key manufactures and geographic regions. 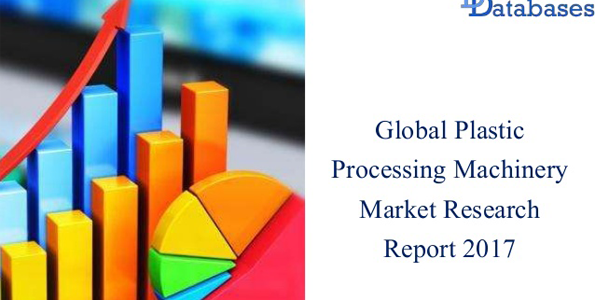 The report includes Plastic Processing Machinery definitions, product type, applications and industry chain structure, development trends, competitive landscape analysis, and key regions development and import/export status. For key manufacturers, company profiles, product analysis, shipment, ASPs, revenue, market shares and contact information are included. For industry chain, upstream raw materials, equipment, and downstream demand analysis are also carried out. Finally, global and major regions Plastic Processing Machinery industry forecast is offered. Market analysts forecast the global plastic processing machinery market to grow at a CAGR of 3.29% during the period 2017-2021. The above data is available for the following key vendors: ARBURG, Husky Injection Molding Systems, Sumitomo Heavy Industries, JSW, Milacron, Alpha Marathon Film Extrusion Technologies, Aoki Technical Laboratory, BEKUM Maschinenfabriken, Berlyn Extruders, Brampton Engineering, Brown Machine, Brückner Group, CROWN Machine uwp, Davis-Standard, Donghua Machinery, Fu Chun Shin Machinery Manufacture, GN Plastics, Graham Engineering, Haitian, INTYPE ENTERPRISE, Kautex Maschinenbau, KraussMaffei Technologies, Lyle Industries, Macro Engineering & Technology, Nan Rong Mechanical, Negri Bossi, Ningbo Haida Plastic Machinery, NISSEI ASB MACHINE, Queen’s Machinery, SencorpWhite, Sidel, Sunningdale Tech, Thai Hydraulic Machinery, Toshiba Machine. Key performing regions (APAC, EMEA, Americas) along with their major countries are detailed in this report. Challengesfor the new entrants, trends & market drivers. Strategic recommendations, forecast & growth areas of the Plastic Processing Machinery Market. Emerging opportunities, competitive landscape, revenue & shareof main manufacturers. Presentation of Data in the report: The data is presented in the form of pie charts, tables & figures for a quick & accurate analysis of the overall Plastic Processing Machinery market. Further, the report can be studied in depth to gain further insight into the Plastic Processing Machinery market.